Contains high antioxidant level of 7.5-8.95% vs 5-6% for mass-mkt. teas. Character: Lively lime flavor. The freeze dried lime crisps and lemon peel further the synergy creating an 'I want another' finish. 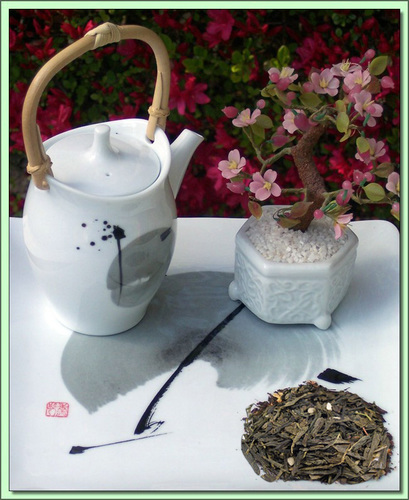 This Sencha style variety was chosen because of its smooth, sweetish taste. This tea has a honey like finish that balances out the natural Lime flavoring beautifully. The smoothness of this Sencha comes from the way it is processed. The green tea leaves are plucked from the same plants as black tea but forgo black teaâ€™s fermentation process. Once they are plucked, the leaves are immediately steamed and bruised either by machine or hand. They are then pan-fried or basket fired giving the tea its distinctive glossy look and feel. The lack of fermentation, steaming, and firing results in a tea with a fresh, and lively character. For a real pick-me-up, try this one over ice, it's fantastic. Ingredients: Luxury green tea, Natural dried lemon Peel, Sweet lime pieces, Nat. Flavors.